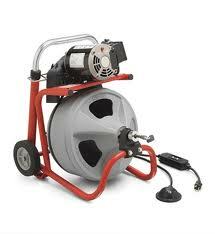 Water jetter, also known as high pressure drain cleaner, is a very common Sydney plumbers tool for unblock clear drains. The concept of a water jetter is very simple. High pressure water hose is inserted into the blocked drain pipe. The water effectively cuts through and dislodges the blockage. Althought simple, water jetters are only effective when used by an experienced Sydney plumber. Without the blocked drain skills, the blockage may only partially be cleared, or the blockage moved further and deeper into the pipe system.